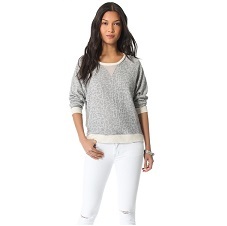 Tonal Cheetah print subtly details a slouchy fleece sweatshirt from Townsen. Contrast ribbed banding trims the edges, and an inverted suede triangle accents the scoop neckline. Long raglan sleeves.